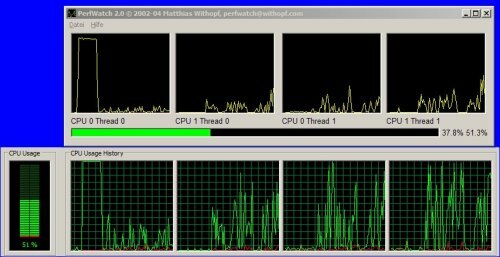 The Windows program PerfWatch is in the c't article Virtual Tandem (c't 24/2002 p.120) emerged, and shows internal load on the processor or processors of the system to. The display of the Windows Task Manager is in most cases significantly higher, since he utilization at the level of the operating system displays the. This includes the times when utilization, in which the processor waits internally, for example, a main memory access. ...... internal waiting times do not count. It's kind of the "net-working" without breaks. In order to increase the utilization of a processor, Intel offers the Pentium 4 is a technology called "Hyper-Threading". The lower the internal load is, the more one can of "Hyper-Threading" benefit. To determine the load, makes use of PerfWatch "Performance Monitoring Unit (PMU) of the processor. The Pentium 4 is one of the event" UOPs Retired ", the Athlon, Duron and Opteron event" Retired Ops ", the Itanium and Itanium 2 the event "Retired IA-64 Instructions" minus "Retired NOP Instructions" and XScale processors, "Instruction executed". To run PerfWatch you need administrator rights in order to query the PMU PerfWatch can start the driver. Q: I get a 64-bit version of Windows (and Windows Vista/x64 7/x64) the message "The drivers necessary for operation can not be loaded error code 9,0,12,577. Was kann ich tun? What can I do? Qweas is providing links to PerfWatch 2.11 as a courtesy, and makes no representations regarding PerfWatch or any other applications or any information related thereto. Any questions, complaints or claims regarding this application PerfWatch 2.11 must be directed to the appropriate software vendor. You may click the publisher link of PerfWatch on the top of this page to get more details about the vendor.